Complaints of TSA agents getting way too up close and personal while searching passengers have sprung up from virtually every corner of society. Supermodel Bar Refaeli recently took to her Twitter account to say she'd been felt up by one agent, and Rep. Francisco Canseco publicly accused the TSA of assault after he says he was given an "overzealous" screening, to name just a few instances of TSA-hate. Finally, the government appears to be taking steps to better deal with these genitalia-grabbing agents. 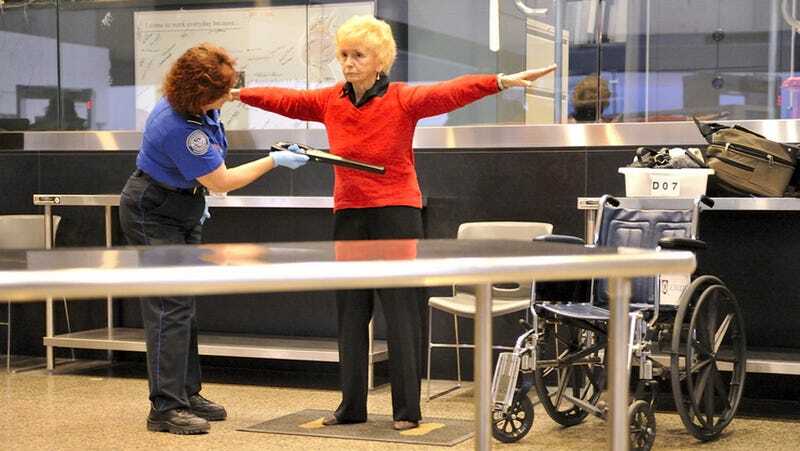 Yesterday, Homeland Security Secretary Janet Napolitano announced at a Senate hearing that the Transportation Security Administration will add "passenger advocates" to major airports. Their job, according to officials, will be to help people file complaints. That's nice, but perhaps their time would be better spent watching agents closely to make sure nothing fishy is happening and then making sure any agents who violate the rules are made to spend the rest of their careers standing in front of a specially-designed baggage claim conveyer belt that carries suitcases round and round and yet the agent's bag just never seems to show up. Image via Carolina K. Smith, M.D./Shutterstock.